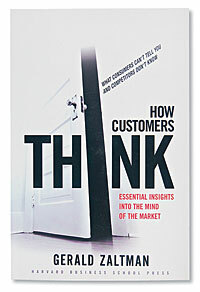 I'm reading How Customers Think, by Gerald Zaltman, this week. This is perhaps the best text I've read on understanding the mind of the consumer. Zaltman takes potentially complex information and presents it in a form that is relatively easy to digest. Zaltman explains how new brain science research indicates that the confidence marketers have placed in focus group methodology has been based on a number false assumptions including the following: 1. Consumers think in well-reason, linear ways to evaluate products and services. 2. Consumers can reasonably explain their emotions, feeling, preferences and behaviors - and translate them into words; and 3. Consumers' memories are accurate reflections of their experience. According to Zaltman, the reality for consumers is really quite different. But I do not want to spoil the content of the book.